A perfect session beer, Hayseed has a tremendous flavor profile without having to ratchet up the alcohol content. The saison/farmhouse ale style is flavorful enough to tantalize with hints of pepper present amongst a slight bit of hop bitterness. The beer opens up considerably after warming up for a few minutes, resulting in a different experience altogether. The bitter elements fade into the background while a hint of wit style sweetness comes into focus. The wide amount of twists and turns that are present in Hayseed mean that an individual can quaff a few glasses / bottles and never be completely sure about what will be presented in a subsequent sip. As such, this beer would work perfectly no matter whether one pairs it with red meat, chicken, fish, or pork – it is able to accentuate the variety of flavors and elements to a dish while being assertive enough to act as a palette cleanser for even the most heavy and intense of flavor profiles. This is a great stand by the fire sort of beer; get a few six packs, a warm area, and a few buddies and the times will be memorable. 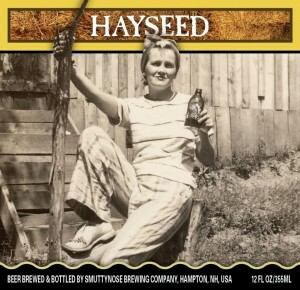 If you are in New Hampshire, make it a point to visit the titular restaurant to have fresh Hayseed, experience some of the rarer Smuttynose beers, and to try out the brewery’s take on dinner.